We have a winner in the Fun Family Ideas category! 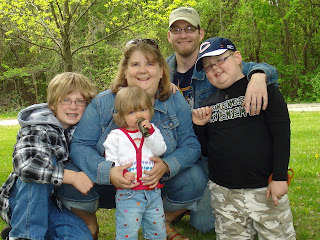 Ryan Simonsen and his family have been geocaching for years in Wisconsin. I knew Ryan and Sheila back when we were young but lost contact with them during the years that we lived in Arizona. I am very glad that Ryan sent this entry to me. He has a great little family that loves spending time together. Our family has done some geocaching in Arizona and Wisconsin. We really like that it is outdoors and free. Anyone at any age can do it and kids love looking for treasure. James and the girls have even done some of the caches Ryan has set up and really enjoyed them. Ever have that thirst for adventure? Have you ever dreamed of finding hidden treasure? Have you ever wanted to go for a hike, but you didn’t know where to go? Have I got a family activity for you……Geocaching. Geocaching is a world wide treasure hunt played with a GPS reciever. This is a fun activity for the whole family and the best part is that it is free. There are over 500,000 caches in over 33 countries and it grows bigger everyday. If you would like to see the full entry with all of the information about geocaching you can go to the main site and read all about Geocaching.